From the northern gates of Glyphstone Village, Crimson River can be seen flowing lazily to the western shores where it meets the ocean. Far upstream, where it winds its way southwards from the goblin cave, it flows more swiftly, forming small rapids and whirlpools between cliffs and tree roots. Snow River starts its way as a small brook, high on the slopes of Firetop Mountain. By the time it reaches the plains, it is a roaring stream that widens further on, before it enters Greenleaf Forest and after that, Mirror Lake. Its waters are ice-cold, much to the joy of the white dragon hatchlings who can be seen frolicking in the river during the day. Upstream, in a deep canyon on the northern slopes of Firetop Mountain, Silver River cascades in small waterfalls, which turn into dangerous whirlpools during springtime. The micaceous rocks glittering at its bottom have often been mistaken for silver, and have given the river its name. In the plains below, the river meanders south to where it joins the waters of Mirror Lake. Serpent River is the last of the three rivers that have its start on Firetop Mountain. It flows northwards, through Shadowglade Forest to the sea, peacefully meandering between the trees and clearings like a giant silver-skinned snake. The dark, murky waters of Darkroot River make it hard to believe this is, in fact, an offshoot of the sparkling, foaming Silver River. As it winds its way southeast through Twilight Wood, dead leaves and rotten branches gather in stale pools between tree roots. Upturned, moss-covered trunks block off whole sections of the river, where the water is littered with decayed remains of small creatures and emits a putrid, nauseating stench. The short river that flows from Mirror Lake eastwards to the sea got its name from the numerous eels that inhabit its underwater pools and holes dug into the muddy riverbank. It is the only river that carries the lake waters into the ocean, and while not very wide, it is deep and treacherous. The Ooze is not a real river - it is a dead branch that extends out of the southern part of Mirror Lake and disappears shortly after in the marshy grounds of the Cursed Swamp. Its stale, muddy waters are favoured by crocodiles that float on the surface, resembling dead logs, ready to swallow an unwary traveller or one of the prometheans that prowl along the banks. 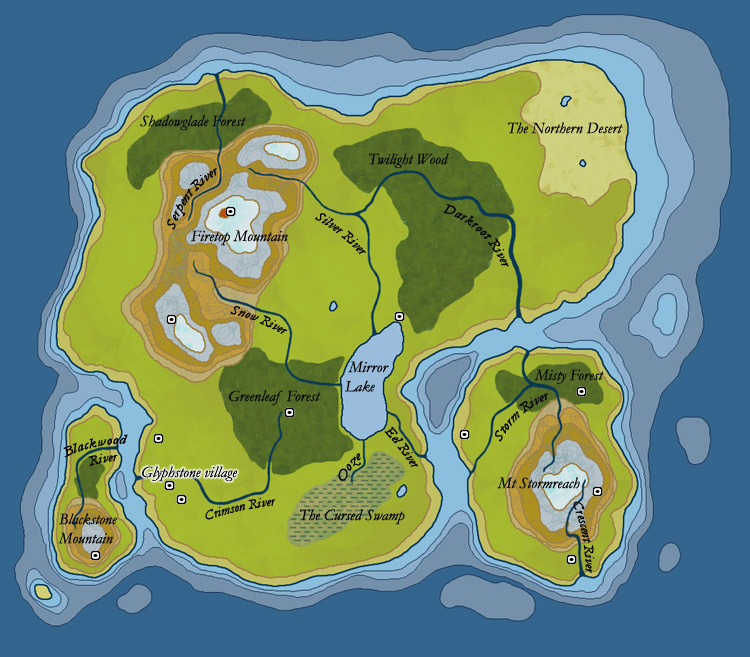 The western island is divided in half by this river, as it flows north down the slopes of Blackstone Mountain and then takes a sharp turn east along the northern edge of Blackwood Forest, towards the sea. Far on the eastern island, among the steep canyons and crevices of Mount Stormreach, a hot spring flows from the ground near the Hellmouth entrance, widening into a river further on, as it takes a slow, moon-shaped turn towards the west and back to the east, around the Arcane Catacombs and to the sea. The water is rich in iron and sulphur and the river itself whimsical and devoid of life, which may be why some consider it cursed. Storm River starts its way near the summit of Mount Stormreach, fed by numerous rivulets that change its course with every new shower. It descends steeply north, gains strength as it passes through the soggy ground of Misty Forest, and turns back southwest towards the shores of the island, where it falls to the ocean in a roaring waterfall. This short, wide stream is an ofshoot of Storm River, parting from the main watercourse deep within Misty Forest where the omnipresent moisture widens its flow, and continuing northwards to meet the sea.